Hills Ideal Balance Feline No Grain - Chicken and Potato dry kibble has been specially developed for adult cats aged between 1 and 6 years. It contains absolutely no grains, making it gluten free and entirely suitable for cats with food intolerances. The kibble offers balanced nutrition that can help to keep your cat fit and supplied with the right amount of energy. The Ideal Balance concept uses only natural ingredients to create recipes with optimal levels of over 50 nutrients, providing the perfect balance of nutrition for your cat's health. Foods that are lacking in proteins, fats, vitamins, minerals and fibre can lead to reduced growth, a dull coat, tiredneΒ and weakneΒ, as well as causing digestive problems. Too much of these nutrients, on the other hand, can lead to bloating, exceΒ weight gain, musculo-skeletal problems, bladder stones and unbalanced gut flora. 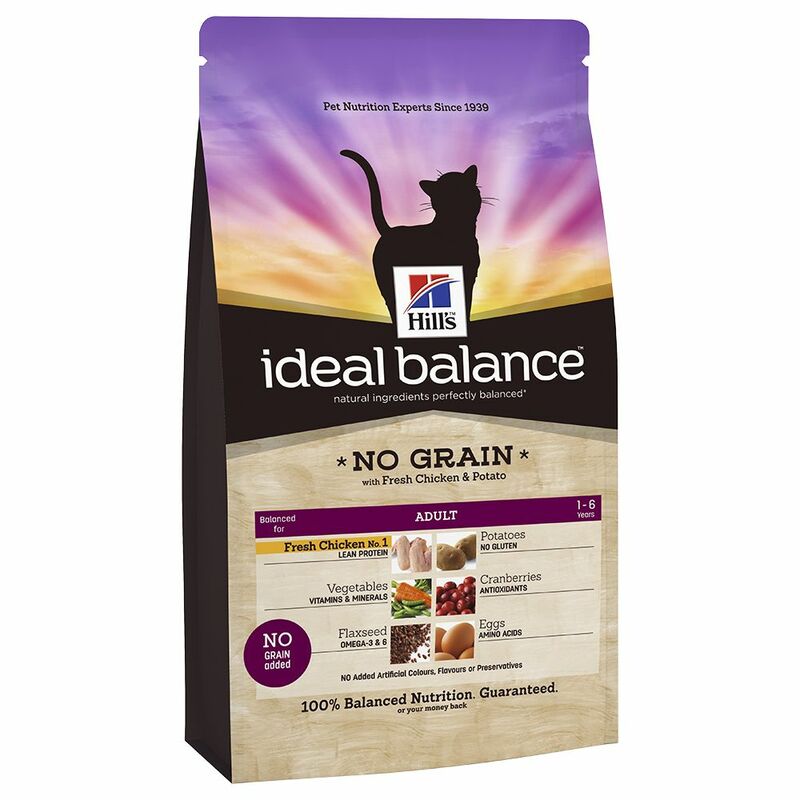 Hills Ideal Balance Feline No Grain - Chicken and Potato is perfectly balanced: The protein levels can help to build lean muscle maΒ and support healthy growth. Fats can improve skin health as well as creating a gloΒy coat. Vitamins, minerals and fibre can help to create a strong immune system, strong bones, and strong teeth, as well as maintaining a healthy digestive system. Hill's Ideal Balance uses only natural ingredients, to ensure it always has a great taste and is highly accepted by cats. The main ingredient is fresh chicken, which delivers especially lean protein to help keep cats lean and fit. Potatoes are a gluten-free carbohydrate source that help to ensure that this food is easily digested. Vegetables supply easily absorbed vitamins and minerals that can also help to strengthen the immune system. As well as supporting the immune system, the antioxidants in cranberries can help to boost your cat's general health and protect the body's cells from free radicals. Linseeds contain Omega-3 and Omega-6 fatty acids that are eΒential for a healthy coat and healthy skin. This dry kibble also contains egg, which contains valuable amino-acids that help to maintain muscles and organs. Hills Ideal Balance Feline No Grain - Chicken and Potato at a glance: Complete food for adult cats aged 1-7 years, with average activity levels Balanced with ideally adjusted nutrient levels Uses only natural ingredients: Creates optimum flavour making this food highly accepted Lean protein from fresh chicken: The lean protein can help your cat to stay slim and fit Grain free: Potato is easily digested and very healthy Vitamins and minerals from vegetables: Support natural immunity Antioxidants: From cranberries support overall health, help to improve the immune system, and protect cells against attack from free radicals Omega-3 and Omega-6 fatty acids: These fatty acids, from Linseeds, can help to keep your cat's skin and coat looking healthy and shiny Amino-acids from eggs: Support organ growth and maintain healthy muscles and organs No Maize, wheat or soya No artificial colourings, flavourings.